His Royal Highness Prince Karim Aga Khan opened a colloquium on the “Present day Students’ Problems” 1960-10-09 | Ismaili.NET - Heritage F.I.E.L.D. “The atmosphere in your University is one of sound intellectual pursuit and you know well what you are aiming at, when you enter the gates of this college and when you leave it.” He hoped that further building of the University would be done “brick by brick” pointing out that that was the process with all great universities including Aligarh and Harvard. 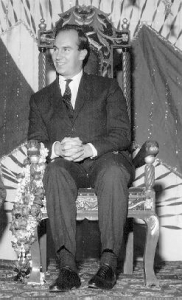 Referring to the observations made by the President of the Students’ Union regarding the need for funds for expansion of the University, Prince Karim said: “There is a not a chance that I could contribute to your University any sum which will knock off a large block from the Rs,25 lakhs which you are seeking” But he added: “if you put up six bricks on one wall and your students by their contacts throughout the country are able to add another six, I do not think you will have trouble in finding philanthropists to match your own endeavours, and if you proceed in this manner, you will have the deepest love and affection for your University.” He further said: “We too know what is deficit budgeting. His Royal Highness Prince Karim also spoke of the efforts of his community to create for itself “those facilities which will enable to carve for itself an outstanding future,” and said that as Imam of the Ismaili community his responsibilities were heavy.